The weather finally broke yesterday afternoon! Torrential rain at 4pm cooled down the hottest period of weather I had ever experienced - and what a relief it was to wake up this morning to this view from my bedroom window! I'm so pleased that this means I can comfortably get back to the torch! I started the comeback in fabulously enjoyable fashion with a half-day intermediate one-to-one course this morning. I know I'm not alone in finding it jolly, jolly hot out there! The heat presents certain challenges to one's day job of working with hot glass, that's for sure. I took a few days off at the beginning of this week, and actually that was no bad thing! I was surprised that our visit to the cinema on Monday night didn't provide us with some respite from the heat in the form of air-conditioning (it wasn't half as cool as I'd anticipated - plus, on another matter, WHY do people go to the cinema when they're ILL?! #germfest) and perhaps curry on the beach on Tuesday wasn't the coolest option - mind you, the sea was very refreshing. Pretty much anywhere at the moment is cooler than a hot-glass workshop with a kiln and a torch running! Good job I love it, right? I had started early this morning, and I've got a rule to stop for 5 minutes every 30 minutes for a pint of water and a brief walk round outside. I'm ever so lucky to have such brilliant air-flow in my workshop - I upgraded my ventilation system back in April, and it's absolutely marvellous! 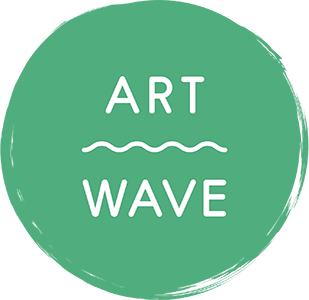 I've felt much cooler this afternoon, because I've been busy working in a north-facing room at home - I've done some paperwork, and I'm just at the analogue stage of designing my promotional flyers for Artwave Festival, which runs from August 18 to September 2. My flyer-to-be! Need to get my skates on to design and print it! The official logo - I've got it in different colours, but I'm loving the green one today! The official blurb - brochure, and posters.